Our waffle station can be added to any Private Event, Birthday Party, Wedding Shower, Baby Shower, or other gathering of people complemented by great food. We have a sweet and savory menu, making it a great option for your entire event. When we setup at your event, we bring a complete waffle station including, plastic-ware, napkins, and a toppings bar. Our station can be customized upon request to match the color scheme, design, and decor of your event. ​A waffle station is very simple yet it works like a charm. To ensure freshness, the waffles are baked right in front of you and then topped with your choice of our delectable topping offerings. There is one flat price given at the time of reservation. We approach each event with the goal of creating a lasting impression by providing a delicious product with incredible service. 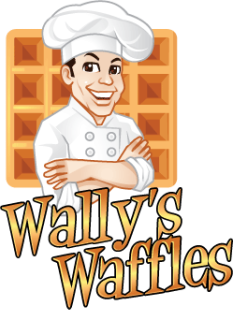 Wally’s Waffles serves the Northern Illinois/Greater Chicago, Illinois region. Liege (pronounced LEE-AGE) waffles are richer and sweeter than the typical American waffle. We have done months of research and experiments with ingredients and processes to bring you the best quality and tasty Liege waffle around. Chunks of imported Belgian Pearl Sugar are folded into our dough. They melt during the rising process and form a chewy, warm, flaky, center with a caramelized crunchy exterior when baked in our cast iron waffle press. Our waffle iron is imported so that we can give you the best gourmet Liege waffle experience you've ever had. This style waffle takes about two days to make which makes for a sensationally delicious waffle. Our Brussels waffles are made with a thin, yeast-leavened batter which makes them lighter with deeper holes and crispy edges. In Belgium, these waffles are served by street vendors and dusted with confectioner's sugar, whipped cream, or chocolate spread. These are the type of waffles to eat when you want to eat five at once. Each waffle delivers bold flavor and incredible texture. Our batter is handcrafted in order to ensure the exclusivity of its texture.